Caring for a child with a life-threatening illness is a draining, both physically, mentally, and financially. Thankfully there are non-profit organizations like Give Kids The World (GKTW) who are there to help. GKTW is a magical resort located in central Florida and gives thousands of free week-long fantasy vacations to those kids and their families. 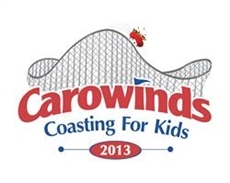 This year, not only have I donated so I can help them bring this magical experience to more families who need a chance to get away and make special memories for their child, I have teamed up with Coasting For Kids and given up one day to help raise money for them and bring awareness to the great work that they do. While you don’t have to give up any of your time, you too can help! Go to my page where you can find out more about Give Kids The World and also donate. Help me reach my goal and make a difference for a child with a life-threatening illness. All money that you donate goes directly to Give Kids The World. The participating parks have donated their resources and those of us participating have paid additional fees to cover the administrative costs.